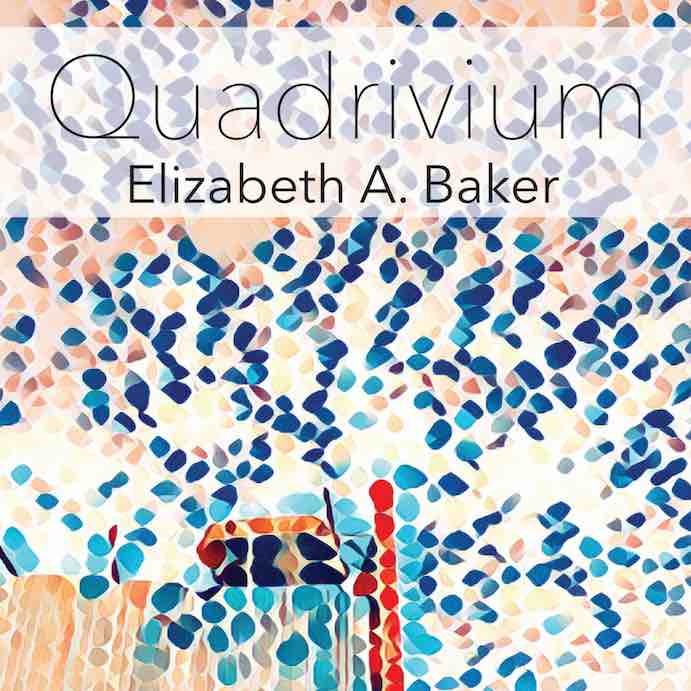 Quadrivium (Aerocade Music AM008 2-CDs) is a nicely sprawling, major dramatically vibrant work of the Modern Music world, brought to us by composer-performer Elizabeth A. Baker. She wrote all the music with the help of Nathan Anthony Corder (Sashay) and she has also written the poetry and lyrics that occur in the course of the work. In the process of the work's sounding Elizabeth performs on piano, electronics, voice, guitar, percussion and toy piano. So those are the particulars. As to the work itself, after five listens I must say I am mightily impressed with it all. Elizabeth makes a point, rightfully so, of providing us with an elegantly worded plea for inclusion in our musical worlds--of all categories of humanity, women, LGBTQs, minorities, in short everyone inclusive. And Quadrivium assumes this viewpoint and at the same time portrays a world in the clutches (if I might interpret her aims) of a sometimes mechanized behemoth that neither accepts differences nor does it always have need for the creative artists who occupy our world and give it value where it otherwise might not or can not have it. If there is a kind of insistence on the creative underground that we advance as a whole both aesthetically and ethically, Ms. Baker surely is one of the champions of such things. And all that would be admirable even if it were left there. But on top of it all Ms. Baker has a deeply conceptual imagination that allows her to fashion a rather monumental, musically and content-fully profound opus. Here is where we stand today, Elizabeth is saying. And that where includes recitations as well as solo piano and electronic, ensemble and small ensemble sections each of which is a sort of microcosm of where New Music is today. So tonality is there, but not for a look backwards, rather as a mainstay of human music making. There is abstraction, there is a repetition that layers subtly ever, a droning that we have in our heads now as much as a result of mechanical and electronic sounds of the environment along with a sort of cosmic centering. This is beautiful music, exacted and not redacted if you will, not afraid to say what needs saying, to play what needs playing, to give us a very pleasureful and sometimes conflicted music representation of the earthtime now, for us, for us who listen. In my case I do not just listen. The music has grabbed me so it says something much more than an organized series of tomes and tones. The work begins with the beautiful and discerning piano solo music that rotates in a very rangy way before sounding some tender diatonics. From there we segue quietly to ambient electronics with inside-the-piano whispers that are almost like a light-bulb afterburn in your mind's eye. The keyed piano returns with a cycle-not-cycle that expands and variationalizes what came before, yet there is new development and new thematic content too. I will not describe the passage of section to section because there is too much and it might be slightly pedantic to rattle off a laundry list of what happens. That sequence in the end will be yours to apprehend anyway. It proceeds to a kind of continual opening up of expression, with electronics and recitation becoming ever more re-grounded and yet musically it feels as an unfolding, a very long and full unfolding rather than a kind of a-b-c-d-e-f-g thingness. The music gives us a highly original take and the text-poetry dwells in the very-much-present. I must say I do very much love this very living work. It is as contemporary as anything you will hear, and it is not afraid to combine deftly timbral and sound-color beauty in striking ways. The music is visceral. The words are frank yet poetic. 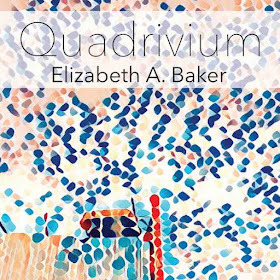 I take it that this is Elizabeth A. Baker's first album of compositions. It is auspicious for that. A brilliant and evocative piece that presages great things to come I would warrant. It is already here. She is here!